This one took a couple days of wrestling, but I finally got something I was happy with. 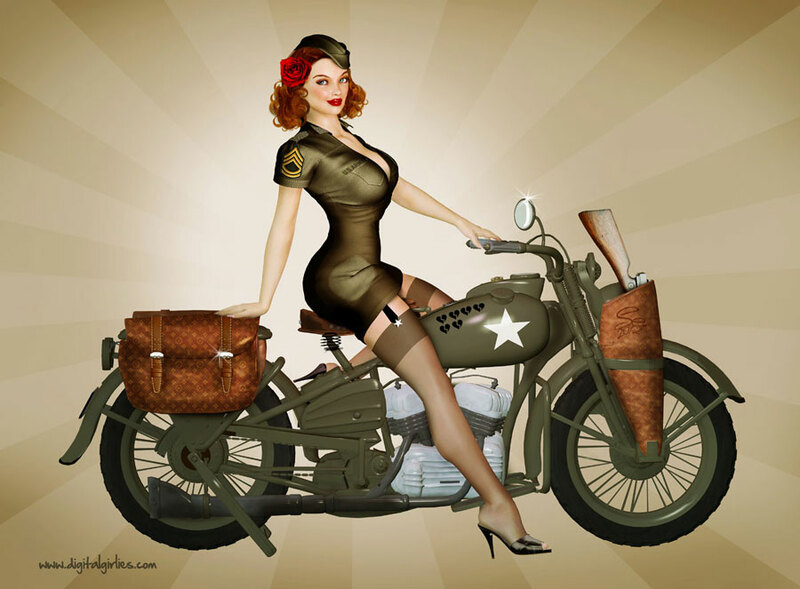 The motorcycle model is a pretty accurate representation of the 1942 Harley-Davidson XA. It was made for WW II, and for some reason I always imagined the war with soldiers driving this baby into battle, but as I understand it, it never saw any action. Apparently there was a competition between Harley and Indian to build a combat ready tactical motorcycle for WW II, but the Army decided to go with the Jeep instead. Regardless, it’s always been one of my favorite Harleys so I couldn’t resist picking it up and giving it a try. I’m looking around for some other Harley models to try out, so if I find some, maybe i’ll do a couple more. Once again using a highly photoshopped PD Suzanne from P3Design and this slick outfit from Hongyu.